Long ago, I drooled on the Tucker vise page of the Lee Valley catalog. Seemed really nice; seemed really expensive. So I punted and got a typical quick-release vise. Works great, for flat stuff. 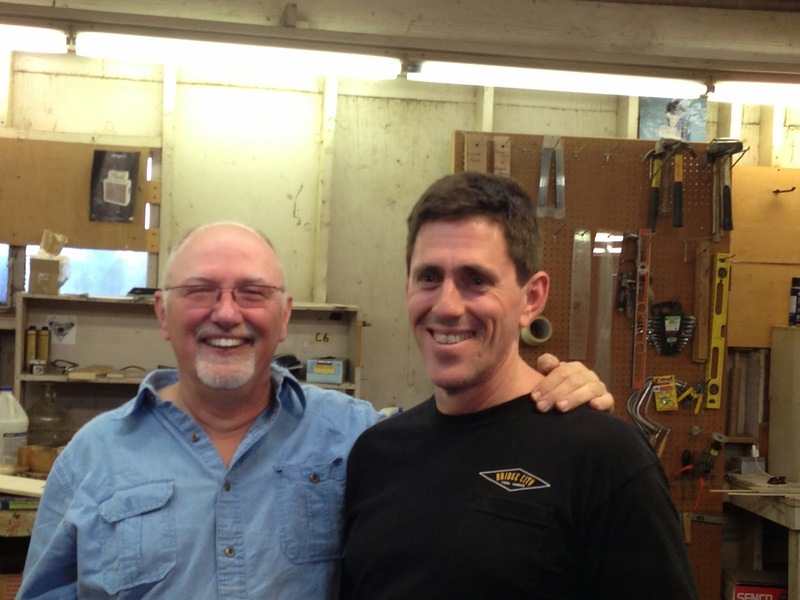 Recently, I took a class from Michael Fortune and had him over to my shop. Showed him my projects and he recommended these two vises from WoodRiver. The Pattern Makers' vise is an Emmert vise-like vise (as was the Tucker, which is no longer made). 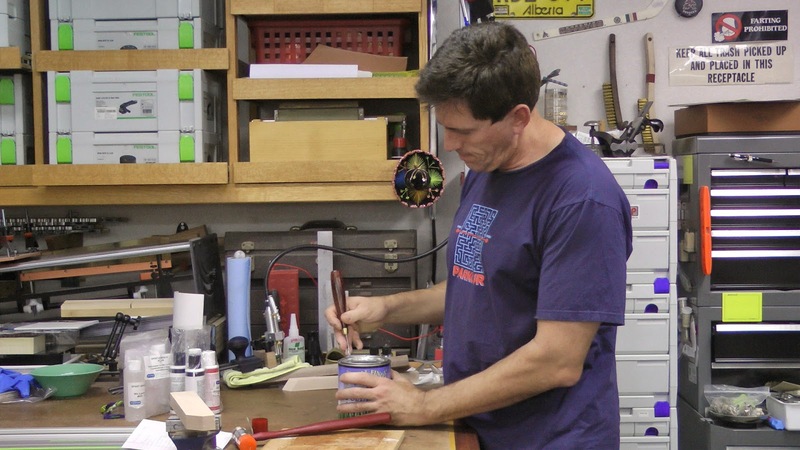 The Gunstock vise is a different style vise, but has a lot of uses. 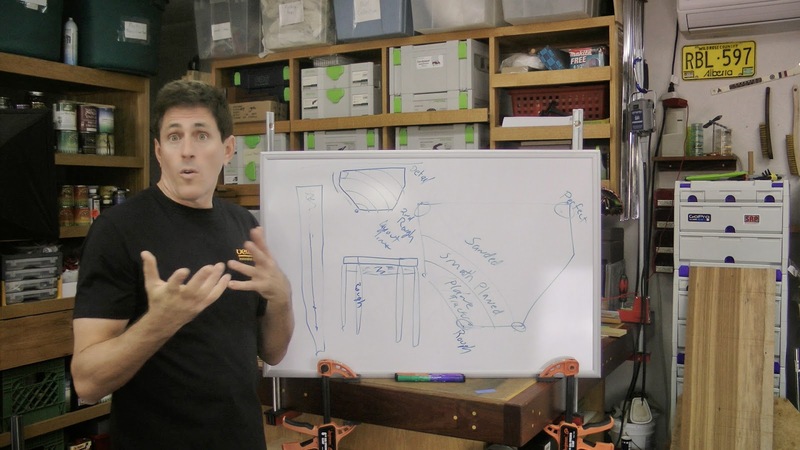 In this review, I'll show you what they do and how I used them on some curved and tapered table legs I'm working on right now. They aren't cheap so getting a chance to see them swing around and how you can use them is likely a good thing. No, seriously, crazy cracks on toenails happen often enough in hockey and this is what I do to fix that problem except this time it was for a fingernail that couldn't stop snagging on everything. Like the pillowcase. Right after you roll over. Next episode, which starts recording as soon as I hit post on this, will make trap doors in the back of these pre-finished panels for pushing cables into the back column. I may do the special episode on wire inlay first since it will cover more of how the wire for those doors will be attached. Not sure yet! And, yes, the past couple weeks with highs over 113ºF have been really draining! I want a ride inside a Zamboni! 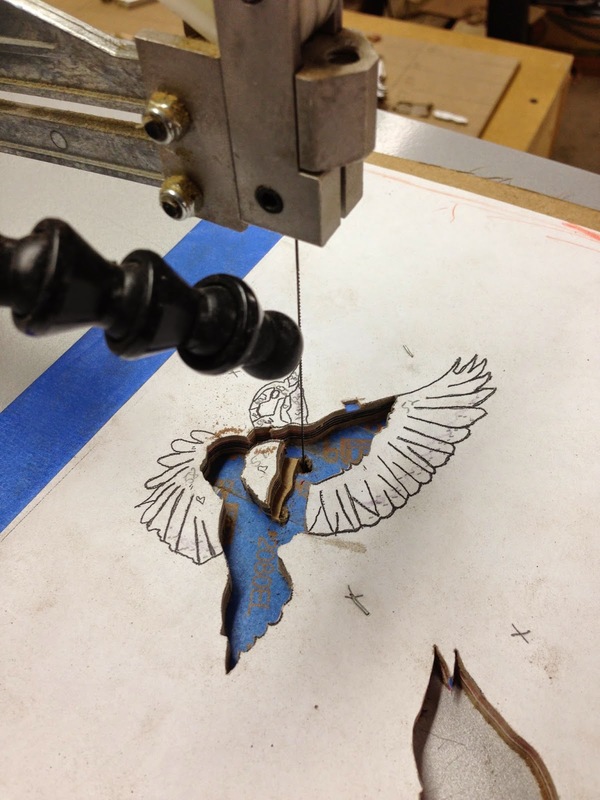 I've been playing with wire inlay recently as there's 35 feet of it for the Angle Madness project. 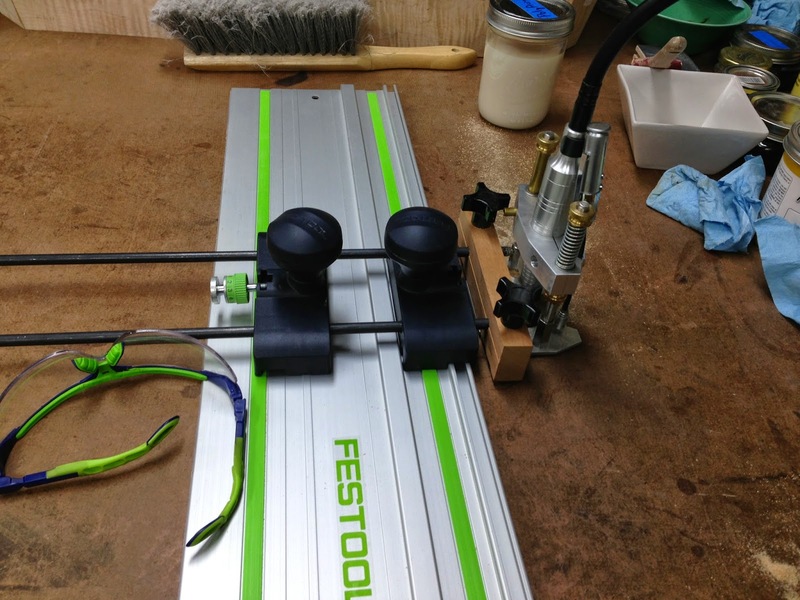 Along the way, I had to make some new base adapters for the Foredom inlay router base. Mine is the William Ng version; it is based on an earlier version of the Stewart-MacDonald base that has since had some nice improvements (link is to the new one). Both are fantastic. William also sells the Foredom kit. 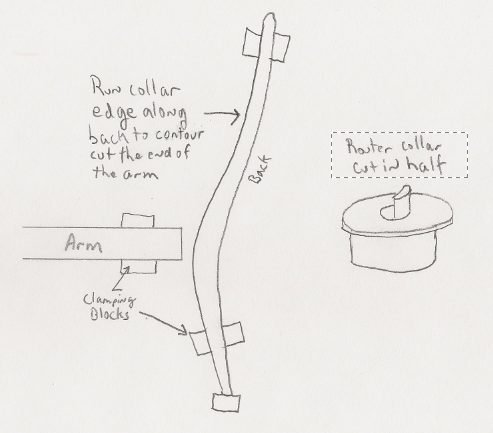 Also, the small router bits mentioned in the video are also from William's store; I prefer these to others because of collar on them is precisely placed the same distance from the tip. Once you set a routing depth, you can swap bits by dropping them to the collar and you don't need to adjust the routing depth with the different bit... saves a lot of hassle with inlay routing. 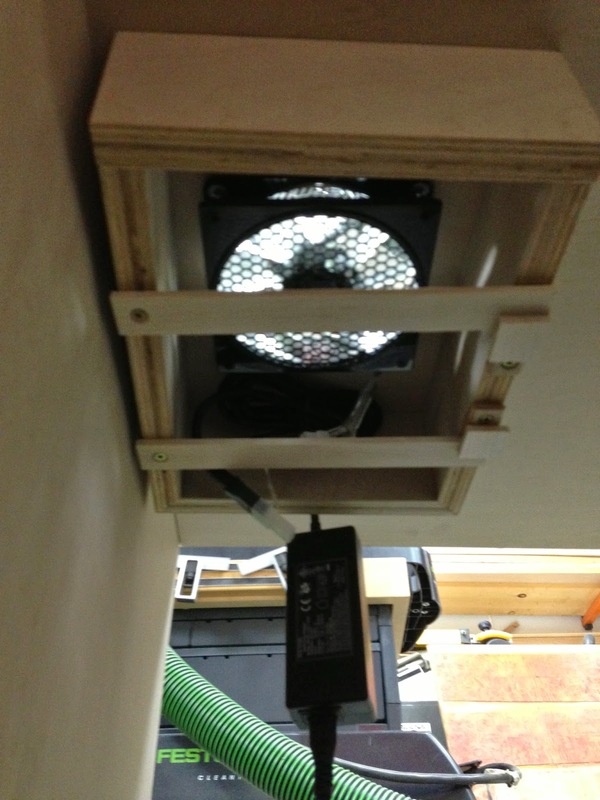 This adapter will get used to route a nice curved opening in the back of each drawer tier for getting all the equipment wires into the back column, but also look good when there's no equipment on the surface as would be the case if it weren't used as an entertainment center. There are some unique problems to solve for the Angle Madness wire inlay as there are for a table I made in a class with Michael Fortune. I'll be gathering up what I learned about it in a special episode outside the Angle Madness series since it'll cover more than I need for that project. wait... is that what I think I did?!? Ghads! Used a Blue Spruce chisel to open a can of finish!?!? I thought only NWWMOTHs did that (non-woodworker members of the household). So last week, I was for-real putting on coats of finish on the Angle Madness panels. When I went to open the can of finish, I looked for the church key on the bench, but there were a bunch of Blue Spruce chisels cuz of a separate project. I thought, "you know, it would be funny to have a Blue Spruce paint-can opener so I could open cans in style and freak out viewers when they see it happen". Yeah yeah, I know, I need to get out more. Thanks, Dave, for what has to be the first and only Blue Spruce paint-can opener! For the record, it required no honing before use. Best I can tell, this is a by-request product so let him know if you want one by sending mail to Dave! 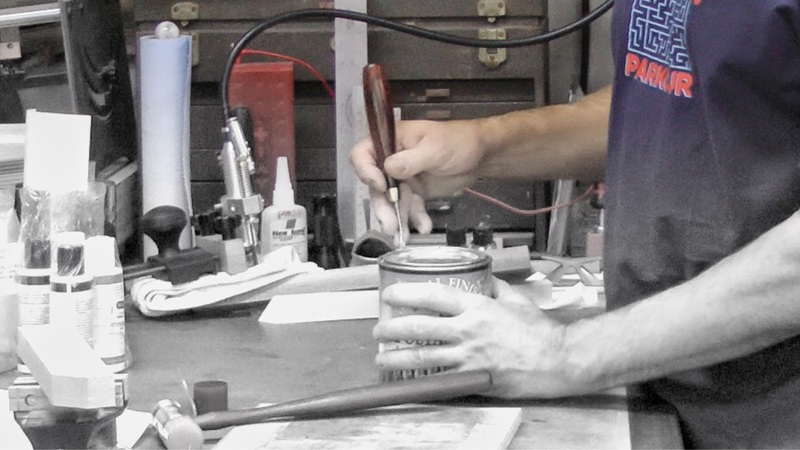 Think about it: put it by the paint cans so when your family need to open a can, naturally they'll reach for your "chisel" (-wink- -wink-) and find that indeed a chisel works wonderfully well at opening cans! Your chisel stash will stay safe. 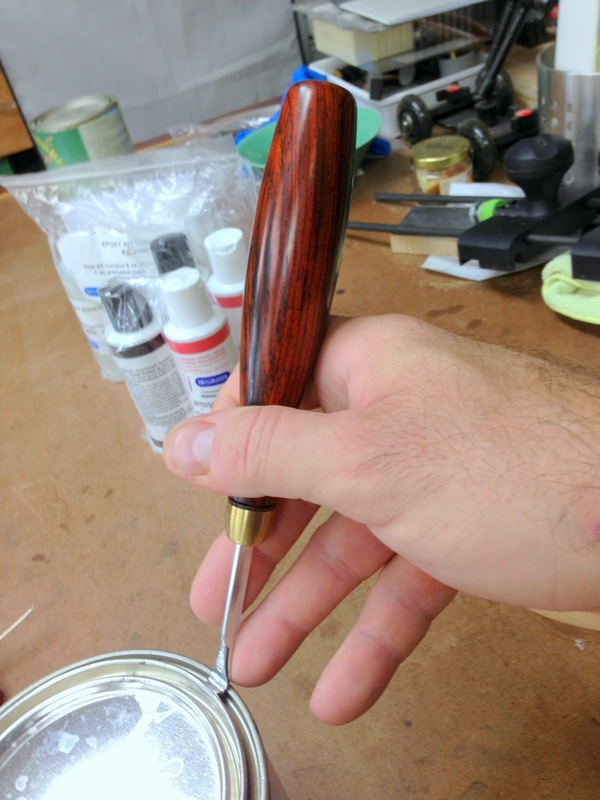 A stylish decoy, in Cocobolo. After posting a couple more photos to my Facebook page, I realized that I should post these progress pictures here from time to time, especially while recording an episode that will take awhile to complete. I'm currently working on a number of tasks on the project, some for the current episode and some for the next two, simply because they all need to be done now to an extent. 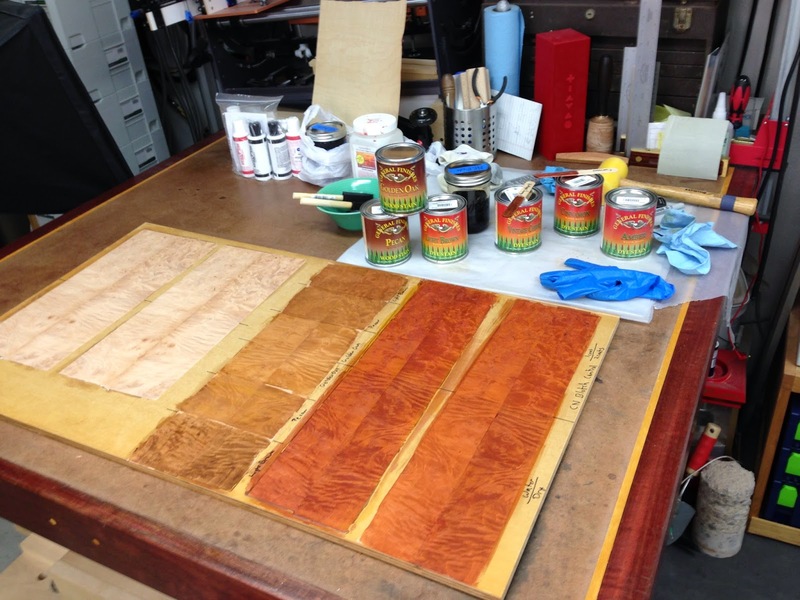 After many finish experiments, I settled on a schedule and color for the burl panels. Was nice to see color go on those! 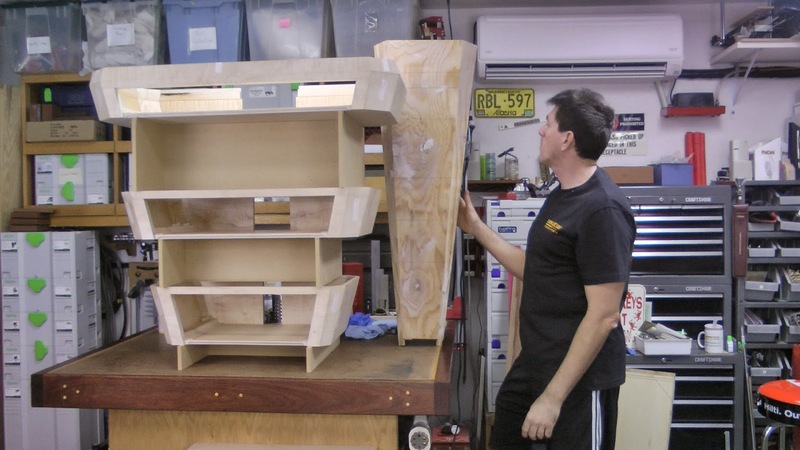 The next episode goes over some of the finish work, gluing in the burl panels, and shaping the boxes. Boxes get their finish, too, by the end of the episode. I've been working on the columns, too. There's a fair amount of work to do on the column start to finish after the inter-tier rods are installed. Oh, yeah, did some experiments to decide on which tubes to use for those interconnects; heading to Industrial Metal Supply tomorrow! The project gets some wire inlay. Actually, 35 feet of it :) I need the exact dimensions of the inlay now though it won't happen for at least 2 episodes. 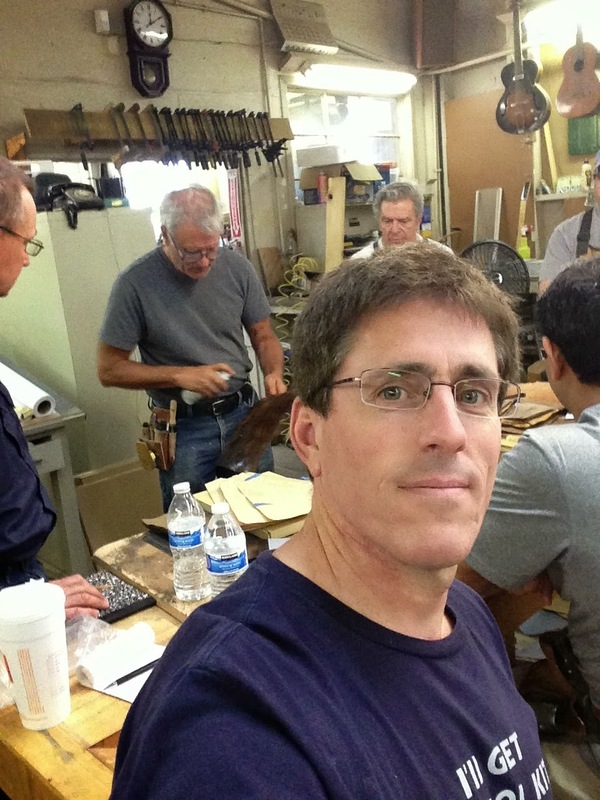 Went to Jared Fine Jewelry and sweet talked the manager to run some sample wire through their rolling mill. Picture a small, very heavy clothes wringer that squishes wire as it goes through. Squished it perfectly although apparently that's not the common way to run it since I spent more time explaining what I needed than it took for them to spin it through. But, was enormously helpful! 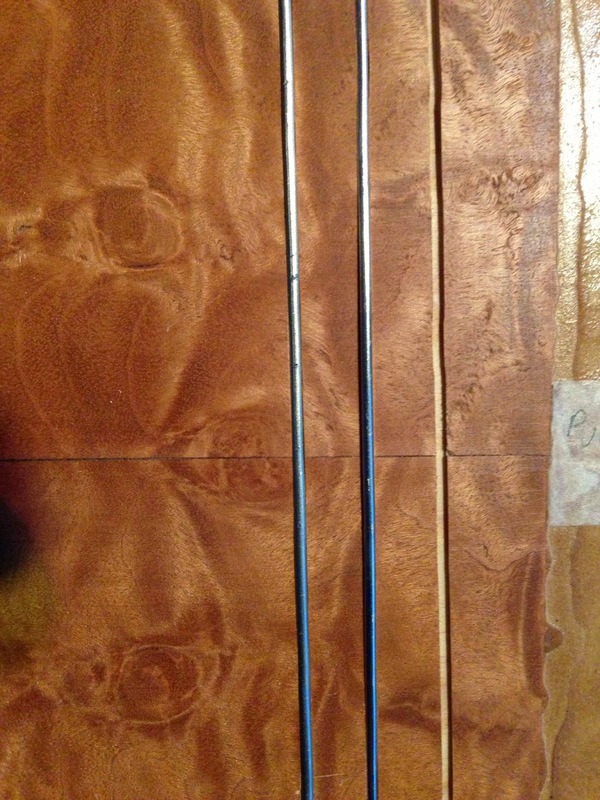 Here you see some different gauge wire inlaid proud on a board where I did sample finishes. To do the inlay, I needed a jig for the Foredom to run it on a guiderail, so built that. I recorded a bit on making it since you could adapt the technique to any number of tools. 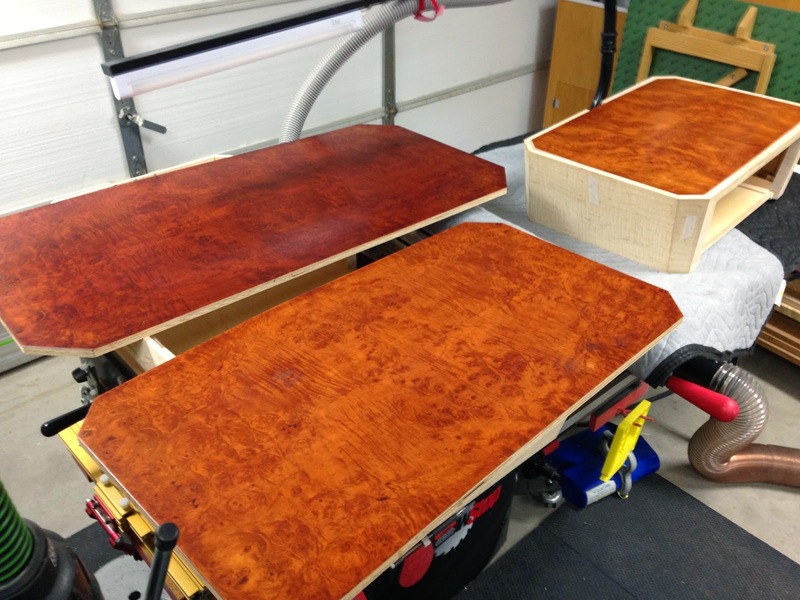 Here's the panels after color and finish; one is dry-fitted into its box. I need to prep some inlay parts before the tops get glued in, though. The panels appear redder in these photos than real life. Everything is a dependency on everything else right now. Sorting it out into episodes that don't jump around proves a bit tricky. Also, besides the Frank Klausz class and Paul Schürch class, I took a class with Michael Fortune; it's tough on the schedule to have three week-long classes within a month and a half, but well worth it for these three. I haven't yet written up an article on this latest class... soon! 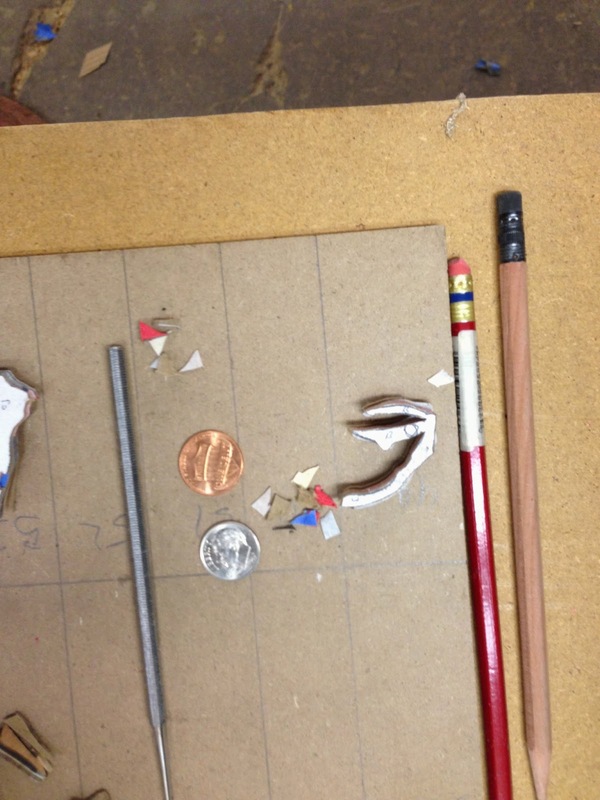 It is another unfinished project, but I'm doing a special metal inlay on the project and will cover that here, as well. The 4 drawers have chalkboard paint on the fronts since he has a full wall like that around the corner. 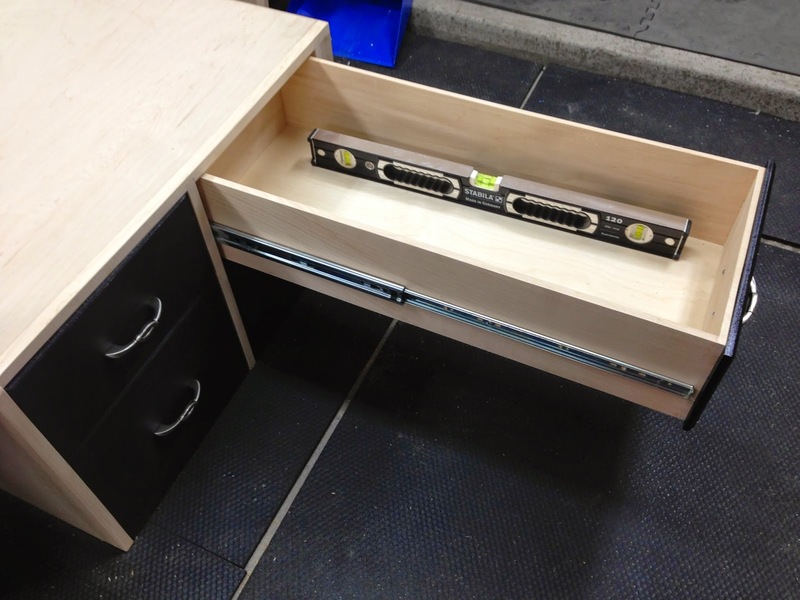 30" long drawers for storing those 24" levels conveniently. 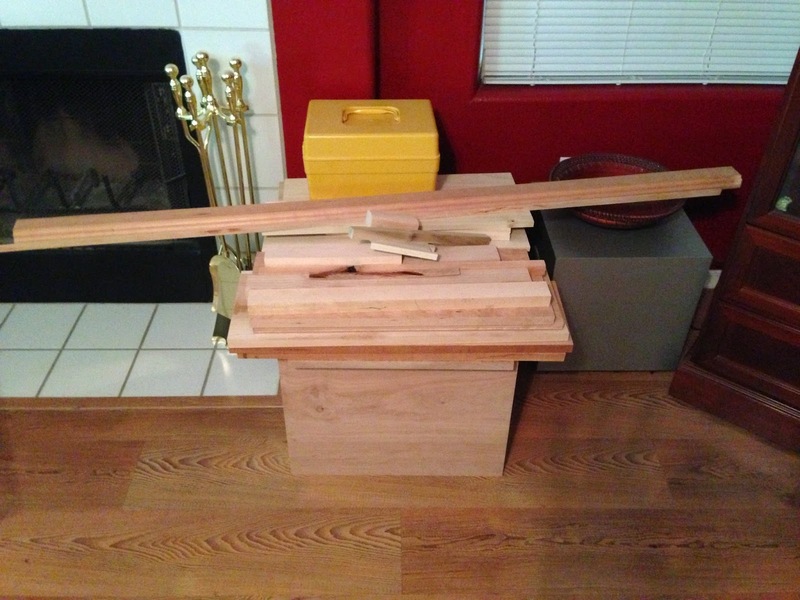 Though this was a plywood project, I opted to resaw Basswood so I could dovetail the drawers... turn it into skills practice. There are also two shelves above the machines hence the stile post standing there (it is attached at installation). The left end is not glued into the groove; instead it has a cleat glued to it and will be attached with screwed from above at installation. The cabinet has to be moved into the closet tilted then dropped into place; that would be impossible with the left end in place. Not a great project, but thought to share the photos in case it gives you some ideas. I'll add photos here of the install when that happens. 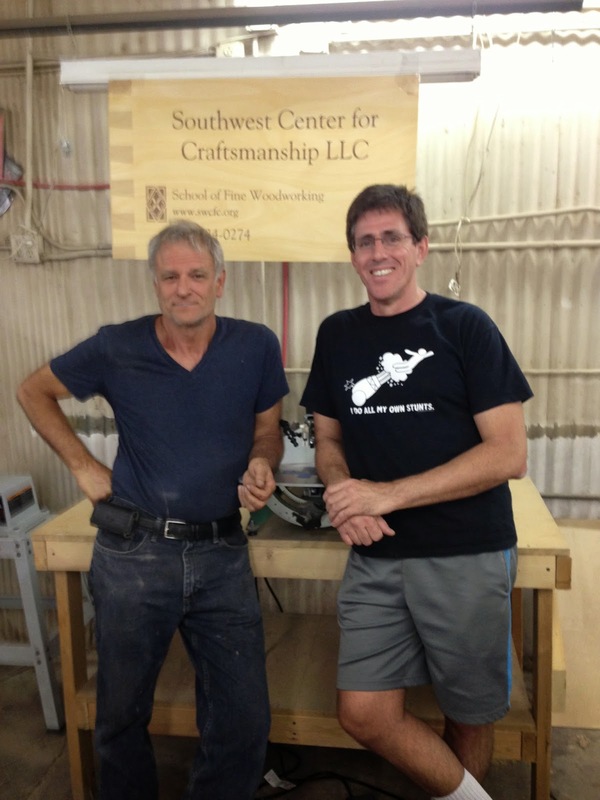 Paul Schürch recently returned to Phoenix at the Southwest Center for Craftsmanship to teach his marquetry class again. This is the same class I took a couple years ago and wrote about here. Yes, he's flipping a 1½" chisel in the air in the photo :) He's a professional; don't try this at home. Since this would be a repeat class for me, I sent him a private video beforehand to ask if I could come up with something more advanced and do that in the back of the class getting guidance from him as he milled about. The video also included my project proposal. He was all over that idea. 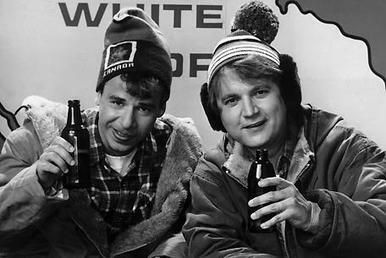 Plus I benefited from watching the original class all over again. My idea was to build a small half-round-ish table with four legs. This is the cartoon on my packet before cutting. The red curve line indicates where the border of the table top is located. There's a leg in each of the back corners as well as on the front curves. The birds are Downy Woodpeckers and the trees are Birch. On its own, this marquetry wouldn't be much more advanced than the marquetry presented in the first iteration of this class other than total piece count. This marquetry has a little over 80 pieces. If you count the pieces in the drawing, you'll find many more, but that's where some explaining is needed. The cartoon includes three lines sweeping down from the upper left corner. This divides the cartoon into 4 regions we'll call A, B, C, and (wait for it!) D from left to right. The idea is that this marquetry progresses from an idea or drawing through increasing levels of detail while simultaneously going from grayscale through full color. Section A is a very light Holly veneer and is a single piece; the bird and tree parts in that section will be drawn on the veneer after it is veneered to its substrate. Section B has a light gray background and different shades of gray for the entire bird portion and whites for trees. Details will also be drawn in those "coarse" grayscale units. 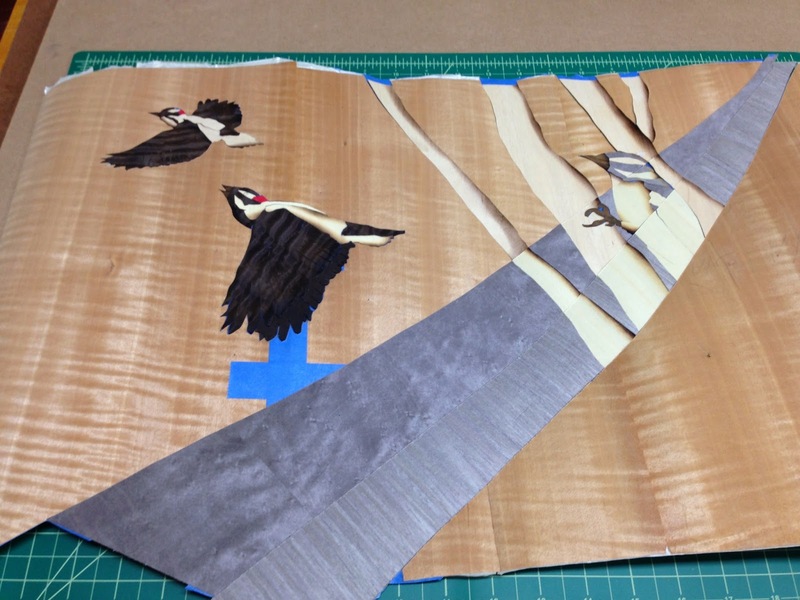 Section C has a darker gray background and each detailed part of the marquetry is cut out of grays and whites. Nothing in this layer is drawn in after the fact. Section D is normal marquetry in full color and detail. 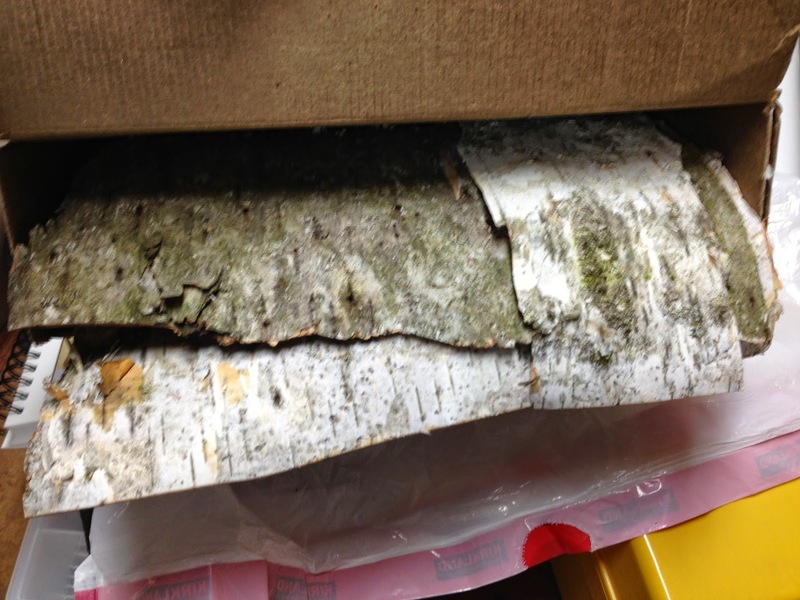 A woodworking friend we'll call the bearded one was nice enough to peel a bunch of Birch bark off his trees and mail it to me. In my project proposal to Paul, I mentioned wanting to use real bark in place of veneer for an added look and texture. In preparing the packet for packet cutting, I included 2 sheets of veneer for the trees. One will be included in the initial glue-up then later routed out; it's necessary to have it in the initial glue-up since you need a full skin for proper parts placement and so you don't have some big place for glue to ooze out. The second duplicate piece that matches the trees will be used to contour-cut the bark to the same size to be placed in the routed recess. At least that's the theory at this point since I just completed a first pass at the skin on the last day of class. This is the skin as of today; you are looking at the glue-side of the skin, which is why it is a mirror image. The section A piece (here on the right) will be replaced with a piece of Holly I had decided on after the packet was in one piece. Contour-cutting that one piece will be easy. 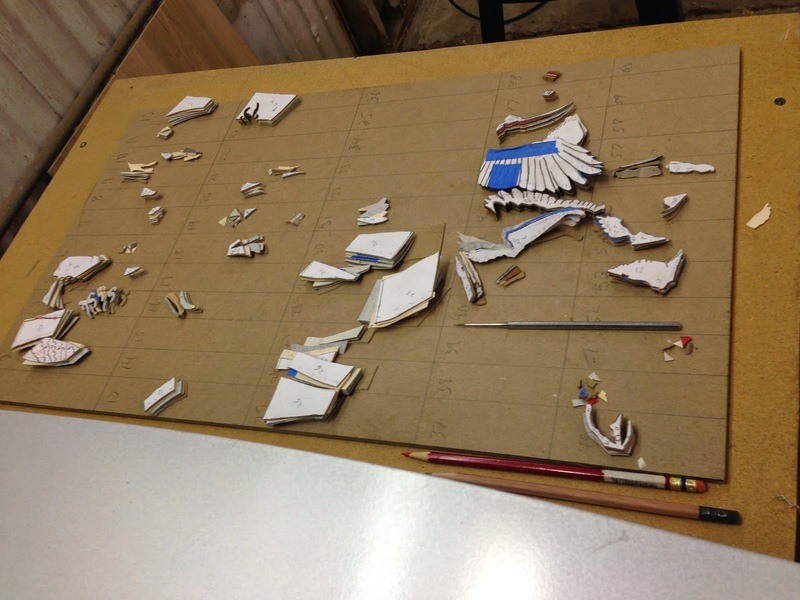 To explain contour cutting, remember that the packet is formed by carefully placing veneers between two pieces of chipboard (the gray board at the back of a pad of paper) with a copy of the cartoon glued to the top. 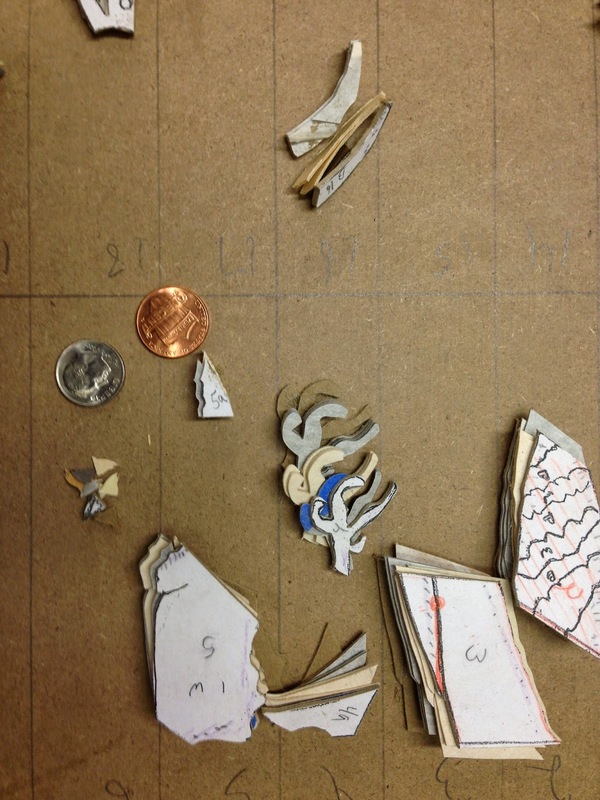 Naturally when you cut out pieces, you get matching pieces of chipboard. 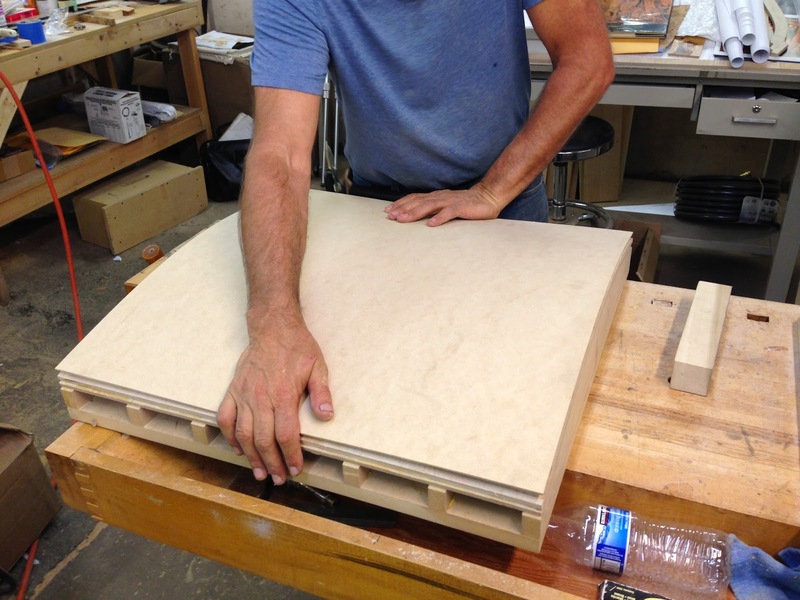 If you lose a piece or change your mind on a veneer, you can create a new packet with new veneer, glue the cut piece of chipboard to the top to be your pattern, then cut carefully around the contour to create a replacement part. 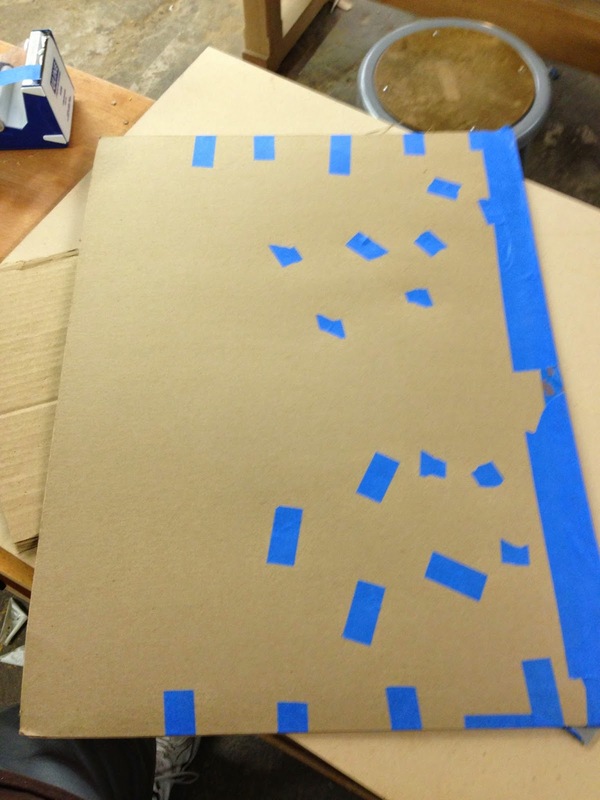 The photo is of the back of the big packet I made for this; the bits of tape cover clenched brad nails that help keep things from moving since using too much tape gums up the blade and makes the packet thicker reducing the number of veneer sheets you can cut at once. In my case, I also sand shaded a number of veneers. Two of the veneers in the B section I decided should not have been sand shaded but rather shaded with the pencil to hold to the cartoon's design. I'll contour cut those two pieces for replacements. The birds lack detail unless you open the picture and look carefully as there are black pieces next to black pieces. However, I'll use white glue to glue it to the substrate so they will be outlined. Paul had an additional suggestion for the tips of the wings' inner features: bleach the black out. I'll be trying that with two-part wood bleach on some scraps... I kept every scrap out of the packet in a special garbage for dumpster-diving replacement parts! I'll say that the veneer for most of the wings is the prettiest I've seen: fumed figured Eucalyptus; the figure's striping looks like rolls of feathers so it was perfect. The image here is from CertainlyWood.com; the sheets I used looked like this but more black. booyeah! Darker wings like those further back behind foreground wings were done with a very thick Ebony veneer. Brittle, hard, difficult to knife for replacements. You could tell when the scrollsaw hit it. It won't be fun to level after the glue-up, but that's another day. Here's the parts board partway through. By the way, Paul recommends keeping the smallest detail to ¼"x¼"... I can see why! I have a few smaller than that; a few is okay, but not after two extra-large Dunkin Donuts coffees. 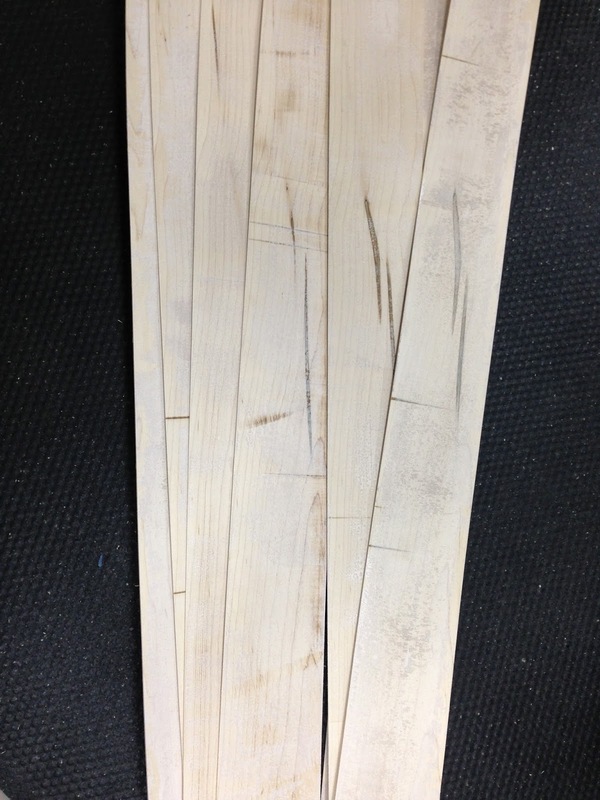 I'll veneer this skin onto Medex, a water-proof higher-quality MDF. 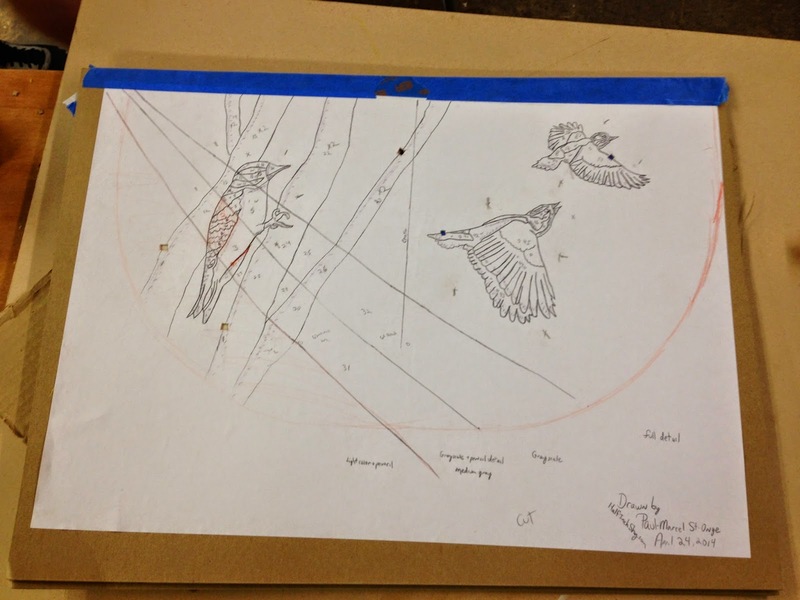 This will be framed in solid wood, though I want to see the panel before deciding which species. The apron will be a bent lamination. I already tried the bent lamination, but my glue (ahem, couple years old) failed. I dropped the apron twice and it completely came apart and the 'glue' could be brushed off with your hand like powder. Bought some new from Paul so we're ready for round two. My lamination uses an external form made of a couple "tubafors". An external form means I'll have the glued-up lamination strips in the bag then clamp the bag to the form. When I did the dry-run, everything bent well, but with the glue, it needed coaxing with creative vocabulary. I'll cut a few notches where it will help before the next try. An external form has a benefit that you don't need to put it in the bag. 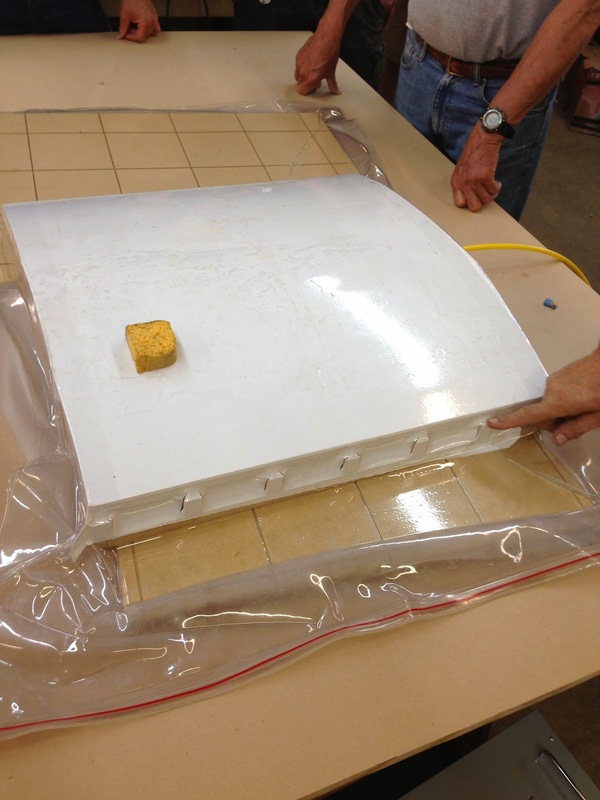 The bag can be smaller and the form doesn't need to withstand atmospheric pressures from all directions. Contrast this to an internal form. 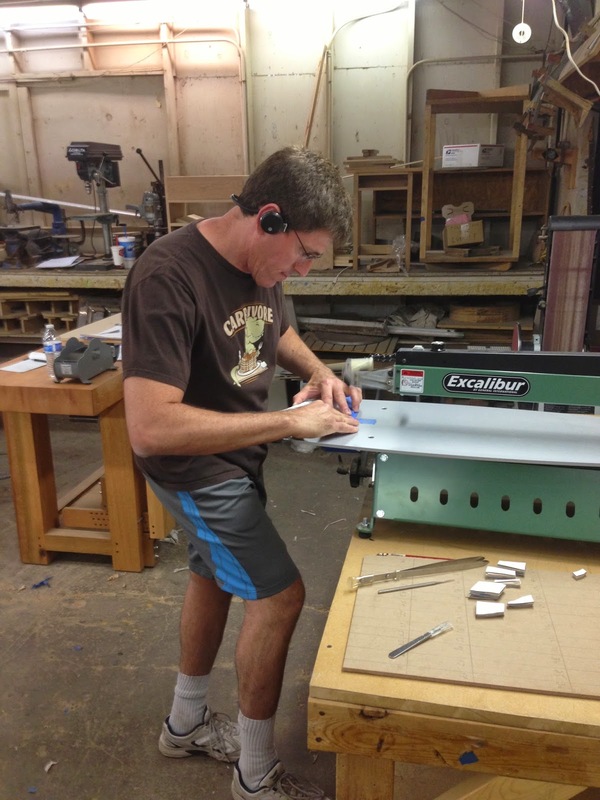 In this photo, Paul is creating an internal form he'll use in a class to be taught in November creating curved doors. 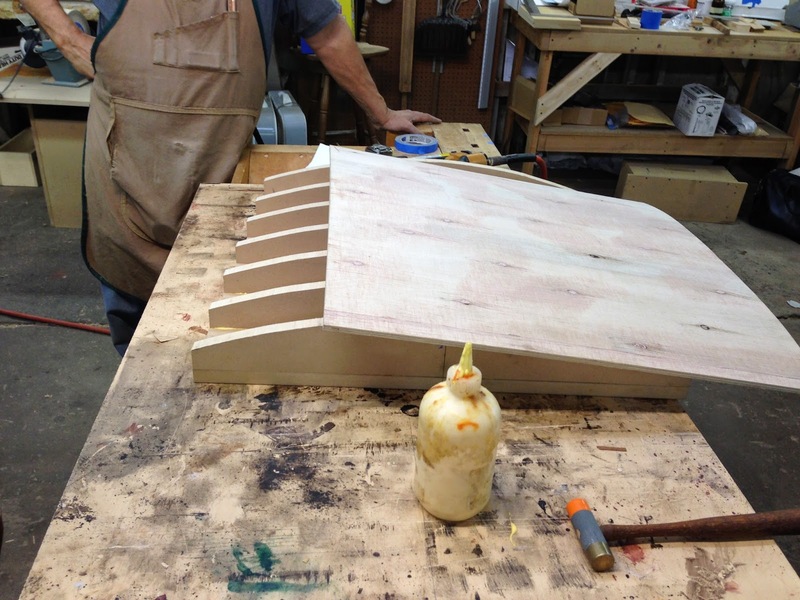 You can see the ribs every 4", two layers of ³⁄₈" bending ply, and a layer of smooth hardboard. Another benefit of the external form is sometimes it is the only option. 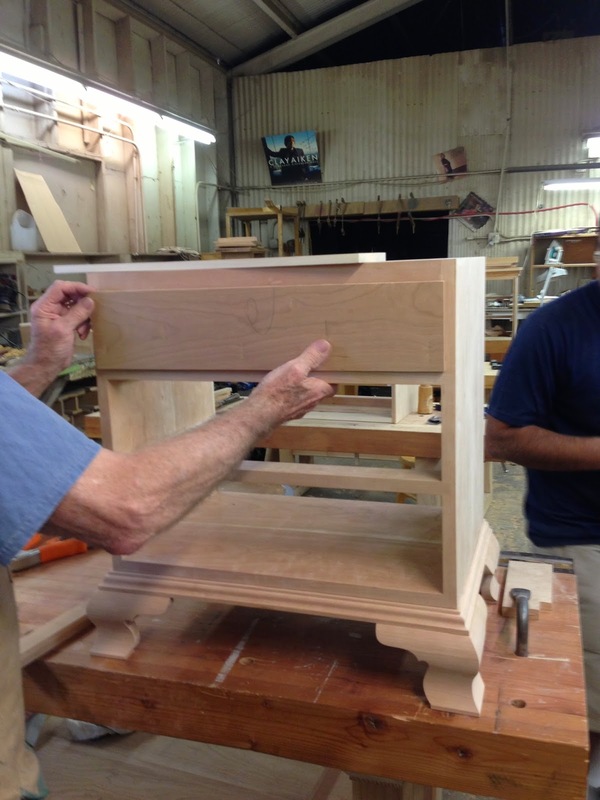 For example, Paul created a bent lamination for a spiral staircase. It was laminated on-site against the built staircase. In this case, he had a shop-made bag 6" wide by 30'+ long. Here's the curved door internal form in the bag when it was getting the final hardboard layer glued on. Back to the curved apron... it will also have a marquetry inlay in it. This is new for me. The marquetry will be simply some wings out of that fumed Eucalyptus inlaid directly into the Maple after turning the wings into plywood. However, I'll follow the design of the main marquetry in that the inlay on the right side of the table will be complete. On the left side of the table, the design will be drawn in. In the front, we have the transition from drawn to full detail with the left half drawn, a small transition section in grayscale, followed by the full fumed Eucalyptus wings. 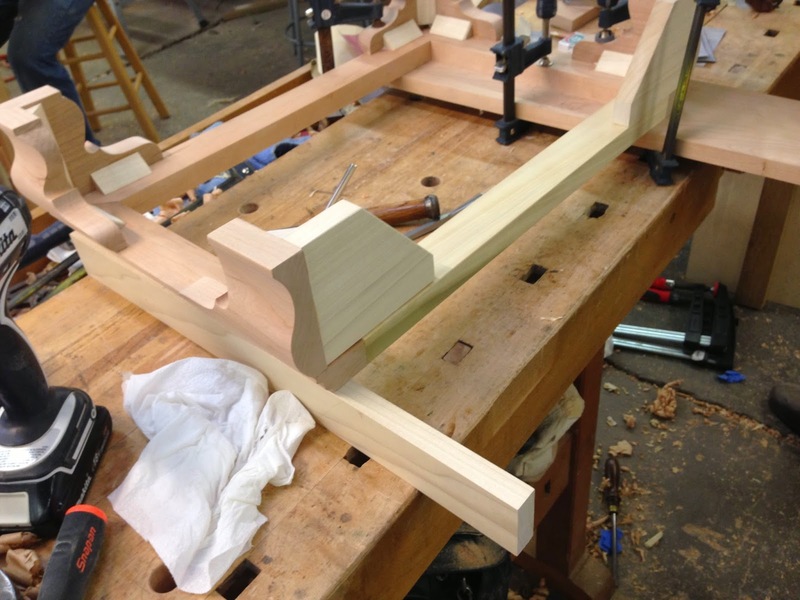 The legs will be tapered Maple legs. There will be an inlay on each, I have some ideas, but will wait for the rest to be completed before deciding. However, they will follow the design with the left legs having drawn patterns, the right-front leg having inlay plus drawing while the right rear leg gets full detail. Naturally, there are no photos yet of what's to come of this project. 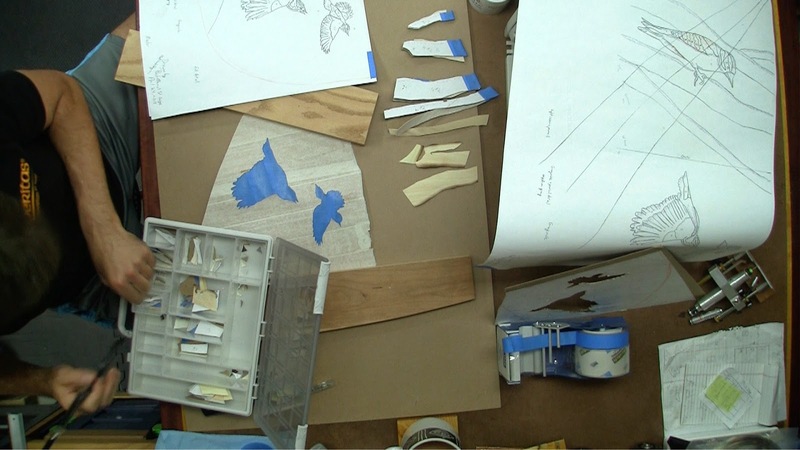 However, I've started recording the steps with the marquetry assembly. 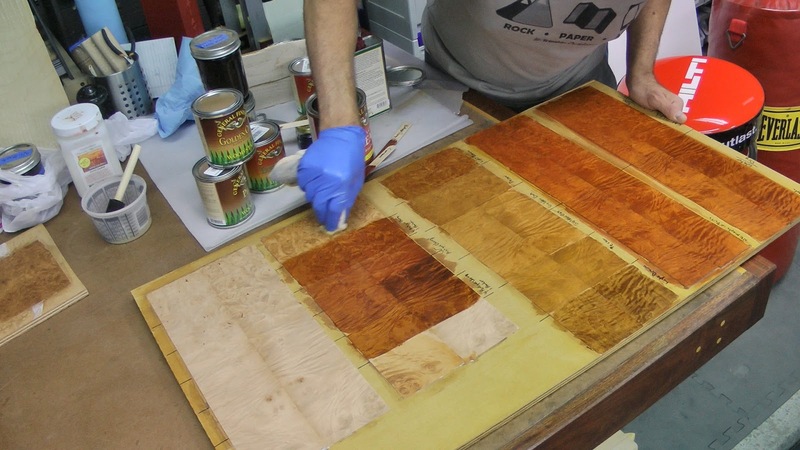 The episode(s) will cover everything after the basic marquetry portion; Paul's two-volume collection covers everything I've done to the marquetry so far. Get both volumes if you are new to veneer. Also remember that the booklet (or PDF for the download version) contains more information than is in the video so leaf through that, too. Do keep in mind this is only my second marquetry. I thought my first (the infamous crocodile scene) was good. That said, follow his DVDs and give it a go with your own cartoon or one from his site. Also, I ran across some lost photos of the Michael Fortune seminar last November. I've since added them to the article. If you read it in an email subscription, you would have missed them. 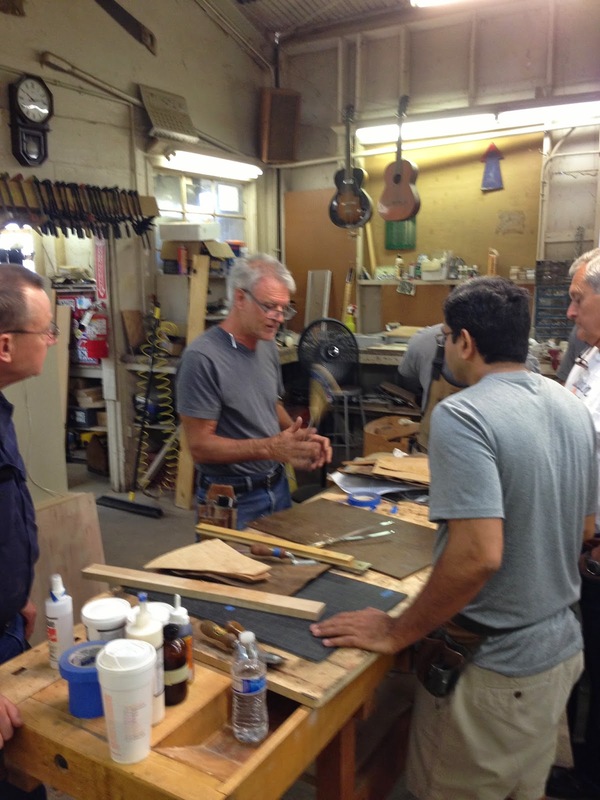 I recently took a class from Frank Klausz at the Southwest Center for Craftsmanship here in Phoenix (it's new!) 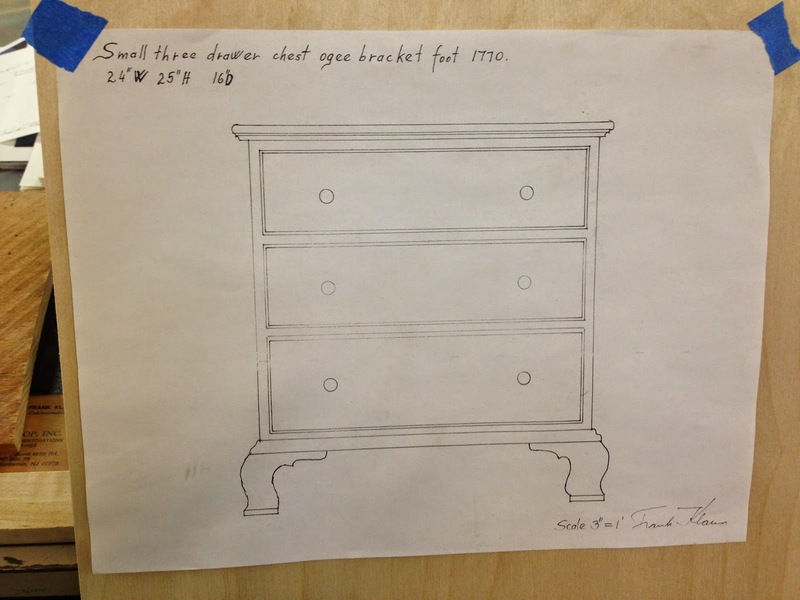 The class was on building a Queen Anne chest of drawers reproduction. The chest of drawers was the height of a night stand so ideally you'd go home and build a second one and slap them on either side of a guest bed. 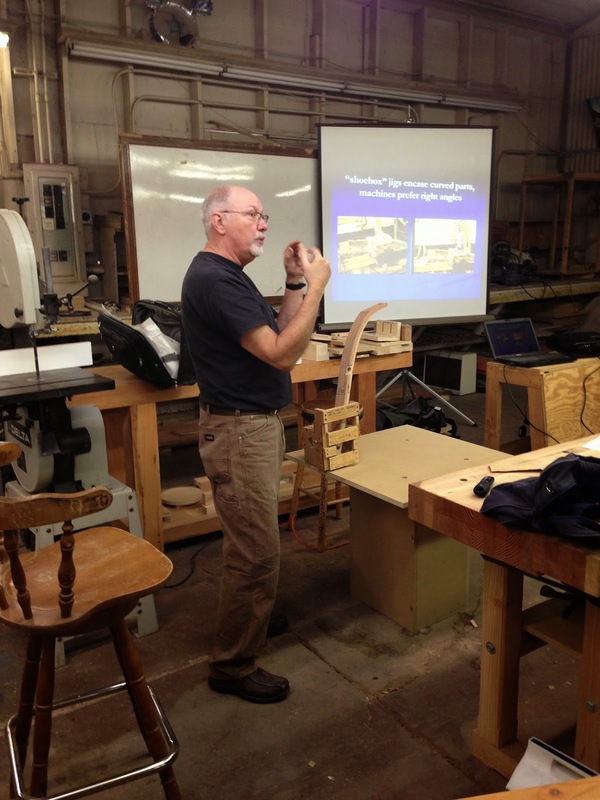 The class started with a lecture on project design covering wood technology, joinery, and finishing. A lot of great take-aways from this first-day lecture as all these concepts kept getting revisited throughout the class. 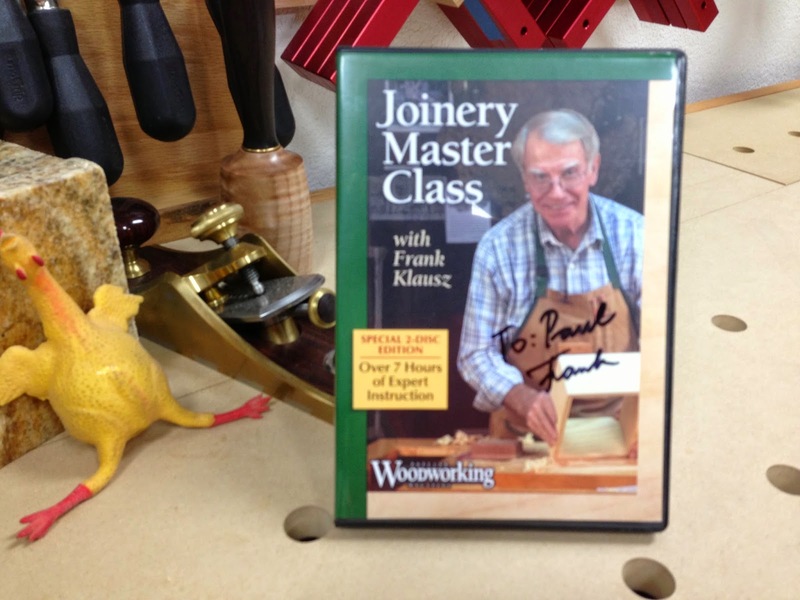 In a related side-note, a week after the class, I received Frank's latest DVD as a gift (oooh, signed!) I started watching it this week. It starts with this exact same lecture and over 7 hours of Frank content... absolutely worth the price. Naturally, we got demos of dovetailing; I've seen these a hundred times (you, too), but still worth the watch. What's interesting about Frank is the lack of unnecessary marking; if you add saddle lines or Xs to mark waste, you're wasting time, although one of his employees has helped him ease the stance against waste Xs. 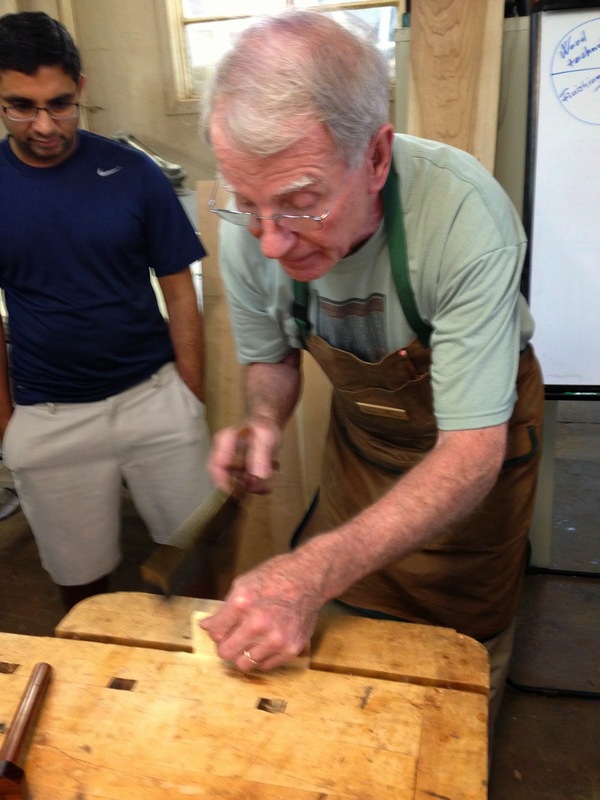 Frank prefers to layout dovetails by eye. 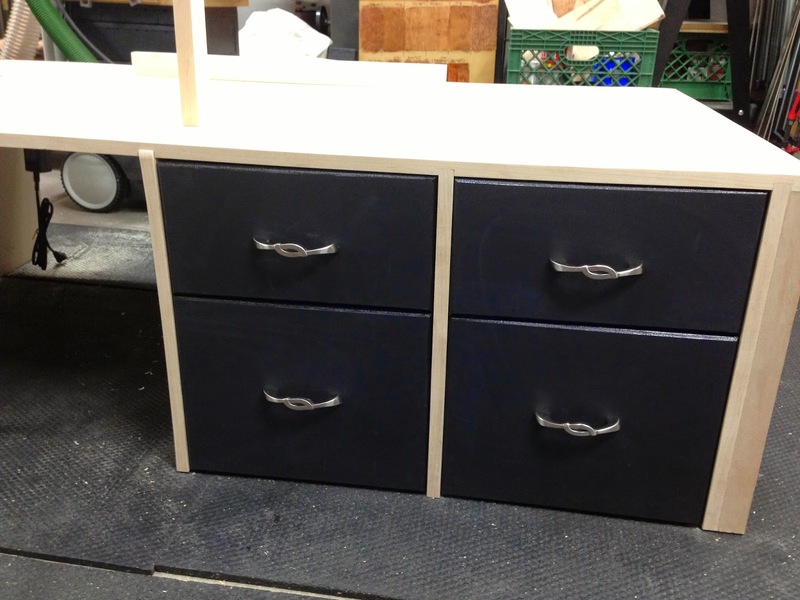 The inconsistencies are what clients are looking for in hand-made furniture. That said, even gaps in dovetails (uh, within reason!) are desirable. In making reproduction furniture, you can certainly use machines, but all machine marks must be removed by hand tools. Surfaces jointed and/or planed need touch-up with a hand smoother to ensure there's the subtle feel of plane tracks and no remnants of that helical-head planer. Further, hidden surfaces are rather coarsely processed leaving visible plane tracks. 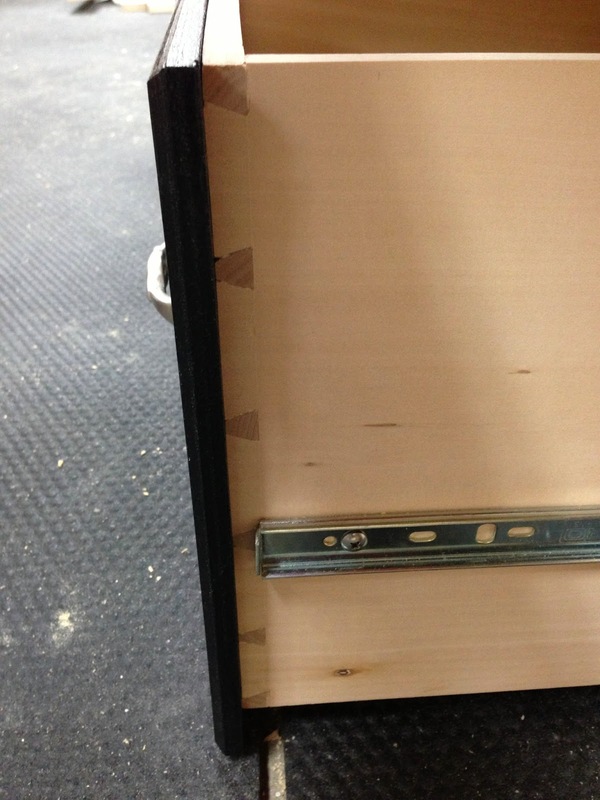 These surfaces would include the back slats, underside of the whole cabinet, back of the bracket feet, etc. Since jointing and planing stock was much more work than tossing it into a machine, time was only spent on visible surfaces. This is also the case with finishing though we know now that balancing the finish front and back is essential to better stability. When planing the underside to give tracks to the texture, he'll often give a swipe or two against the grain to get small amounts of tear out. Show surfaces get planed smooth, scraped, then lightly sanded with P180. Good tip: when attaching a mirror to furniture or jewelry box lid, be sure to use mirror mastic; if you use silicone, you'll see spots on the mirror after a few years. Yeah, I might have done that mistake. 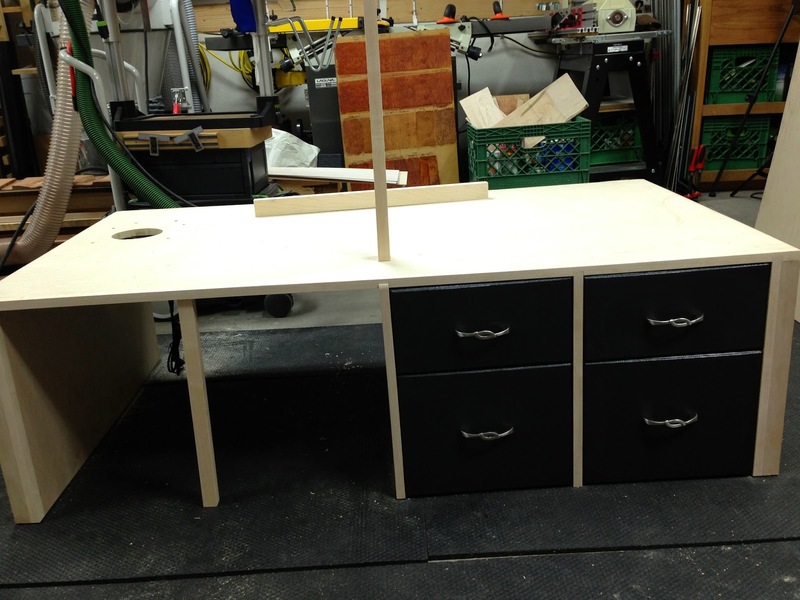 Sadly, this is my resulting cabinet... organization and student issues meant we were 2 days behind on the build. 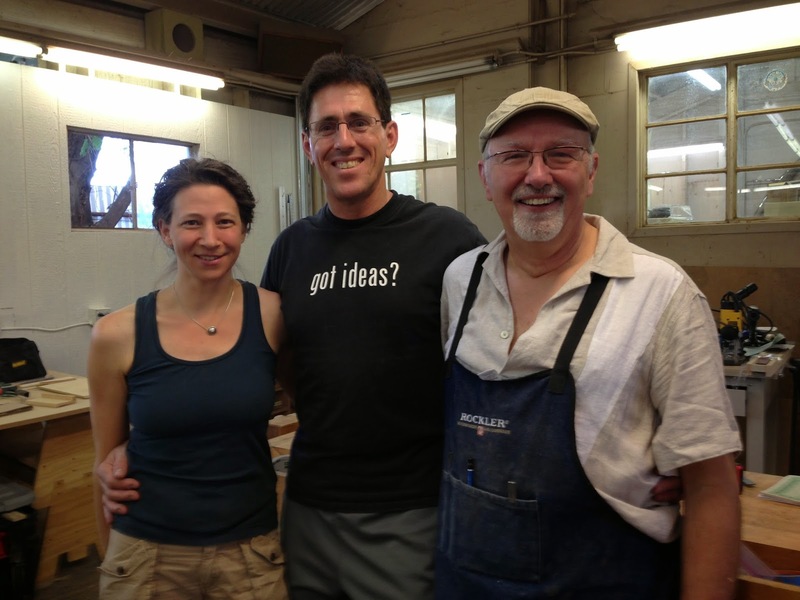 Frank's taught this class before and it fits, with work, in the allotted 4 days (first day was a lecture day). However that assumes more offline stock prep and sticking to the "intermediate-advanced" student requirement. It's a new school with growing pains and I think this will be the last time this fumble happens. 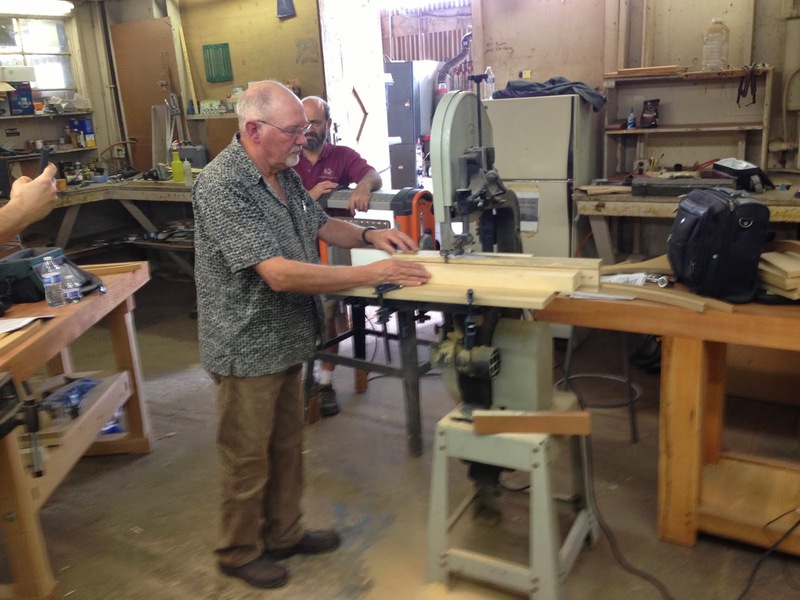 Here is a photo of Frank showing us where the drawer face is attached to one drawer whose dovetail demo was done after class on the last day. The bracket feet add a lot of elegance; if you recall my No Comment #1 build, the bombé box's sides and mini-bracket feet are all made the same way as these feet. Pretty easy to do (you can see the exact same process in action on a smaller scale in No Comment #1 for the feet here except those feet had the bombé profile applied with a router bit; for these feet, the bombé profile was done on the table saw like the No Comment #1 box sides). What remains for me to do here at home? Glue up the bracket feet, cut the base the case sits on, plane a bead around the drawer fronts, half-blind dovetail the fronts to the drawer, glue up the drawer bottom panel and bevel appropriately, ship-lap the back boards and nail them in place, apply a round-over on the top, and attach the top with floating blocks (shown). If more work was left to do, I'd certainly consider doing all the molding with the HP-6 mini multi-plane. 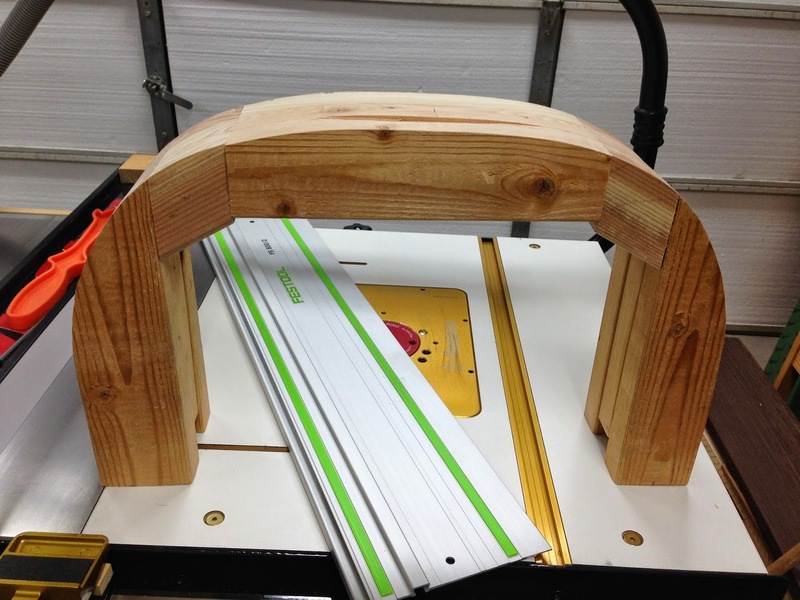 The ogee of the base molding and cove that goes under the table top are all easily done with that plane and more fun than a router. Certainly, I'll use that plane to apply the bead on the drawer fronts since I have the plane profile, but don't have a router bit in that dimension. 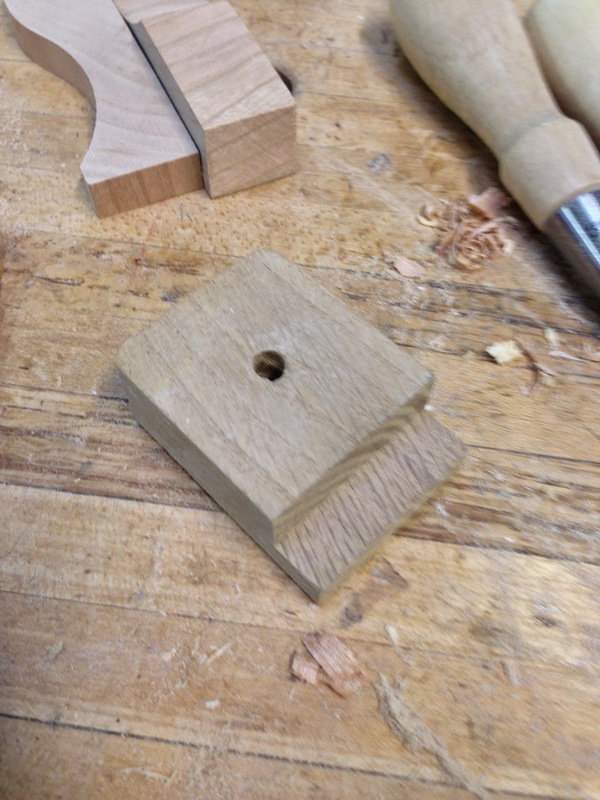 Lastly, rather than buy a ³⁄₈" radius round-over bit, I'll use my crowning plane... not the same profile, but the crown to me looks much nicer than a full round-over. The drawers will get two brass pulls each; likely these pulls. 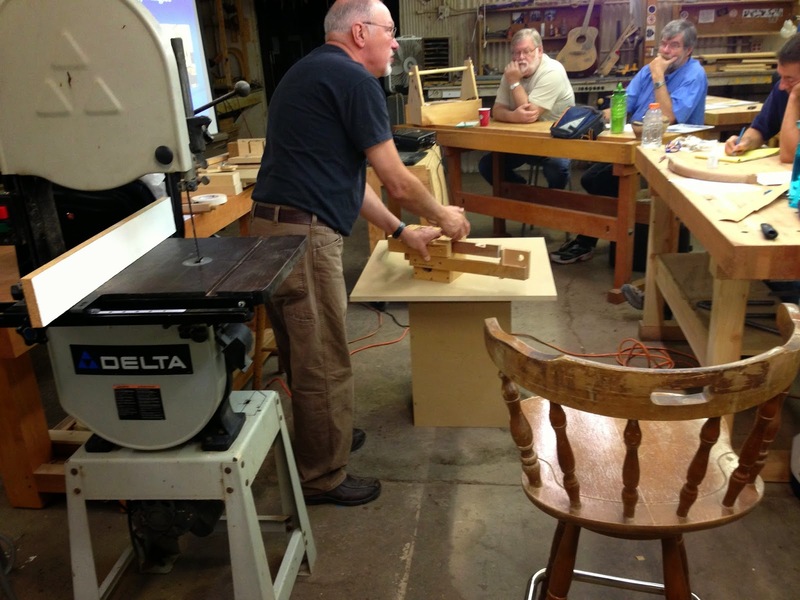 One evening during the class, 4 of us stayed with Frank and the director until 9:30 at night prepping a lot of stock, running moldings, and running the cove on the table saw. This was to try getting us caught up. Starving, we ordered out some pizza, but like most pizza delivery places, they don't cut the pieces completely. Fortunately, we had a chisel and mallet to take care of that. Pretty sure that chisel won't be rusting anytime soon!